00.04 – Dave: Well I had one or two things like forts that you could take part and build up again when you’d, when you needed them again. Holly: So tell me about them. Holly: So what did you use to play with then? Dave: Nothing really. I’ve got to be honest with you, there were so few toys around. I came from a pretty bad area, like a low working class area, and we didn’t have much in the way of toys. We used to improvise. If you had a stick, it became a gun. Dave: If you, you could turn a chair over and it became a tank. And things like that, you know. Holly: So you used normal objects to make them into, and pretended that they were other things. Dave: Yeah, that’s right, yeah. Dave: Well, we mainly played out in the street to be honest with you. We played, well, we played football, and kick out ball, and all like that. You wouldn’t know that, young women like you, but we didn’t really have anything to play with, we just improvised things. We had a string, with a tin can tired on the end of it. Someone stood in the middle of the ring and turned it round, and we all hit it with sticks as it went by. And we called it slapcan, and if you, if you hit the string instead of the can you had to go in the middle and spin it round. Dave: You see, those are silly games we used to play. Dave: One game called piggy. And you got a piece of wood, about two or three inches long. And you sharpened one end so that it looked like a bullet. And then you put it on a stone. And then you hit the sharp end and it used to shoot up in the air. And then you’d hit it as it come up, and it went so far and if I were playing with you, I’d say right, that’s five yard away, I’ll give you four jumps to reach it. If you reached it you got the four, but if you didn’t reach it I got the four. Dave: Oh, I’ll tell you what we used to have, what we called trolleys. There were four wheels, with a plank, with a bit of seating on it, and we used to have them. But of course they were out in the street again. Dan: Did you use to race each other on your carts? Dave: Oh yea. Oh aye, yeah. Dan: We were speaking to someone earlier on about the brakes that they used to use. Was that the same for you? Just use your feet? Dan: [talking over Dave] yeah your mother must have . . .
Dave: But we loved that, because it used to make sparks as you went along, you know. Andrea: Oh of course, iron clogs. Dave: Mm. we had leather clogs with irons on them, and if you went like that [gestures] it made sparks. But of course it rubbed the metal down, quicker than just ordinary walking, and you used to get a clip round the earhole off your mum or your dad if they saw you. Holly: Excellent. And where did you spend your childhood? Dave: Where did I spend what? Holly: Where did you spend your childhood? 00.20 – Holly: Okay. So, teddy bears. Did you have a teddy bear? 00.25 – Holly: No? Not at all? Okay. We’ll move right on. How about dolls? Did you play with any dolls? 00.33 – Holly: [laughs] No. Excellent. Shortest interview ever. How about construction toys? Did you play with any construction toys? Dave: Well I had one or two things like forts that you could take part and build up again when you’d, when you needed them again. Dave: I had a fort which you could like take apart, and a few lead soldiers, that sort of thing. Holly: Yeah. So what sort of games did you play in your fort then? Dave: Well, war games really, you know. Some of the tin soldiers would attack the fort and some of them defended it. All rather childish, but of course that’s what toys are for aren’t they? Holly: Definitely. So were there any toys that you saw that you wanted that you never got, or . . . Like, did you see an advert for a toy that you really wanted? Dave: Well, no dear. You see, they weren’t, they didn’t have things like that during the war. Well, not in the area that I lived in anyway. Dave: I’m not being much use to you am I? Andrea: Because actually, I think that talking about people not having many toys, or not really having toys, is just as interesting as a list of loads of toys. So did you – obviously you didn’t have many toys, you improvised, what sort, did you play as a child? Dave: well, we had to improvise. There just wasn’t the toys around in them days. Dave: Well, all my friends, little boys, none of them had much in the way of toys, you know. As I say, lead soldiers, they were popular, and you could get them. And you could, well I can’t really think of any other toys I had apart from a few lead soldiers and this fort. I had a rocking horse, a little rocking horse, yeah. 04.20 – Holly: And how did you get the rocking horse? Was it made for you, or did someone else make it? Dave: When somebody had finished using it they passed it on to the next youngest one, you know. Holly: Yeah, we’re getting a lot of stories of hand me down toys, but across the generations as well, so. Dave: Sorry dear, I’m not quite hearing you. Holly: No, it’s me, I’m not talking up loud enough. We’ve got a lot of stories of hand me down toys from all the different generations that we’ve been talking to. Holly: So it’s very common, or popular. Dave: That rocking horse, of course if I still had it it was probably worth a fortune, in the second hand world, you know. Holly: Do you remember what happened to the rocking horse? 05.15 – Andrea: So you said obviously you know, you didn’t have dolls or anything like that, did you have any friends, or sisters who had dolls, or played with dolls? Dave: You see, my family were boys, so we didn’t have any dolls. So we didn’t have no dolls at all. But I know one or two of the girls I grew up with had dolls. They used to have dolls with plastic eyes that moved about. You’ve seen them have you? Andrea: Yeah. Yeah. But obviously not something that ever interested you. Andrea: Of course. So, you said Bolton you grew up in? Andrea: So city, town, playing in the streets. Not the countryside. Dave: No, not the countryside. Not at all, no. No, we didn’t go to the country very much. We had the back streets of Bolton. 06.30 – Andrea: So did you find yourself actually just playing with what was in the streets? As you say, tin cans, string. Dave: Yeah, yeah, yeah. Oh yeah, played with all them sort of things. We made some lovely games. But you, you wouldn’t know what I’m talking about if I told you stories about them. And anyway, you don’t want to know about that do you? Andrea: Oh I do. I do. Yeah, go on, tell me. Andrea: Okay, got you. That makes sense to me. Dave: And of course there were lots of ipper chipper Charlie things that we could dance round a maypole, you know, all that sort of thing. I don’t think I’m being any use to you girls am I really? Holly: No, you are, because it’s interesting to us to find out about toys outside of our remit. So we’re very constrained on the project, to the dolls, bears and construction toys, so it’s interesting to find out all the games that you played. 07.58 – Dave: I’ll tell you what I did have, what I did have. I suddenly remembered. It was a [clears throat] excuse me. It were about a foot high, and it were a sailor, you know, with the round hat that sailors have, dressed as a sailor, and you took the bottom off, when you bought it, and it were full of sweets. And you ate the sweets, and put the bottom back on, and then you could do what the devil you wanted with it, you know. But I can’t remember what I used to do with that, but I had it for quite a long time. So that were a doll weren’t it really? Holly: Yeah. Toy soldiers as well. You could probably class them as dolls I think. Dave: And you may have seen some of these. You girls, being in the museum. It was always a coloured lad, just the bust of the coloured fellow, and it were a money box, and his hand was like that [gestures] and you put a coin in it and pressed the lever on this side of him, and he used to put it in his mouth. Andrea: I know what you mean, yeah. Dave: Have you seen them? Dave: didn’t leave them in there long though. Used to unscrew the bottom and take the money out. [laughs]. Can’t think of anything else offhand, unless you jog me memory. Holly: I haven’t got any other questions. 09.33 – Dan: I was interested to know what other sorts of games you played, like piggy, where you made your own toys specific to the game that you were going to play. Dave: We played cowboys and Indians. You got a piece of wood and that was your gun, you know. [clears throat]. Excuse me. Dan: Did you ever get the means to make anything bigger like a go cart, or anything like that? Dan: Like a cart? Like an orange box cart or something? Holly: That still counts as construction toys, ‘cos you’re still building it, so we can use that information, don’t worry. Andrea: I do. I do. I love carts. Dan: Did you use to race each other, or did you? Dan: Who do you mean? Andrea: who was talking about go carts and he said they used to stick a stick in the wheels sometimes to make it stop. But it was the same thing, they made their carts. Dave: Some of them, some of the lads who were a bit cleverer than myself they’d put some sort of a brake on it, if they could think of a way pf doing that, but my go carts, I just used to put my foot on t’floor, you know. Andrea: Any other thoughts anyone? Andrea: I was just asking Dan if he had any other questions. 11.55 – Dan: I was just wondering if, because you didn’t have any toys, you didn’t have very many toys to play with, but you had siblings that you could play with, so did you find that you spent your time with your siblings and you didn’t really care about not having toys because you had other company? Do you think it would have been different if you’d been an only child and not had any toys? Dave: I don’t suppose I give much thought to having more toys, you just had what you had, you know. The sailor thing, and the fort, and that sort of thing, that’s all I ever had, you know. And I don’t think my mates had much more. I’ll tell you what we used to do. Of course this is, again, it’s outside. If you could get hold of a tyre. A car tyre. All the kids had these tyres, and we used to roll them round the streets all the time. Everywhere you went, we’d have a dammed tyre with us, you know. You ever heard of that? Tyres? Dave: Rolling them round the streets. Yeah. Well you girls probably know more about, and the gent, probably know more about toys that I’ll ever know. Holly: We’ve got quite a few in the museum so quite possibly. 13.07 – Dave: Just as a matter of interest, where is the museum? Dave: Is that open to the public occasionally? Holly: It is, yeah. Tuesday till Saturday. Ten ‘till five. Andrea: I think I’m done. Unless there’s anything else you want to tell us? Dave: Well I can’t think of anything else dear. Dave: If I’d had any warning I might have had a whole list full, but . . .
Andrea: We did throw it at you rather. Dave: But you specifically wanted to know about toys and I don’t know much about toys. Andrea: But what you have done, is you’ve talked about building things out on the street, which I think is construction. Even if it’s not a bought construction toy it’s construction. And it’s really nice to have someone who’s been able to share those sorts of memories. Dave: One thing we used to get occasionally is balsa kits for making aeroplanes. And things like that. Dave: Everybody used to have them sort of thing, aye. They were one of the sort of things you could get during the war you know. And then you used to hang them up on the roof, as if they were flying, you know. Andrea: Yeah. You didn’t actually fly them then? Dave: Oh no. I suppose some of them were sophisticated enough to do that, but not me personal. Just used to hang them up with a bit of string so they looked like they were in the air. Andrea: Yeah, some people used to put tissue paper on wings as well. Dave: And then of course you’ve got the kites. You know what kites are don’t you? Dave: And everybody had a kite. ‘Cos you could make them out of a few bits of wood and, as you say, tissue paper and a ball of string. Simple thing. You know, not like today. Can I just make an observation? There were some people who were into toys and they gave, this was a few years ago, and they gave the toys to a group of children, and they also gave them some foam sort of dolls and all that, that you could twist. And the children preferred when you could tie their arm in a knot rather than wind the thing up. I remember that, yeah. Dave: Mind you, that was only a few years ago. I was grown up by then. Holly: There’s the joke about the favourite present at Christmas being the boxes that all the toys have come in. I remember one Christmas one of my cousins was playing with the toy out of the Christmas cracker. And she was more interested in that then her toys. Dave: With boxes, you can just make a building out of it. Or something, you know. Andrea: And if it’s alright with you Holly’s going to be in charge of this interview. Is that alright with you? Dave: Am I the only one here? Dave: I’ve just had a traumatic experience, that’s why I’m a bit flustered. I walked into somebody out in the corridor. I’ve been coming here for over fifteen years, I should know better. Holly: Before we start, we’re just going to close the door to block the outside noise. Sorry, just because the recording equipment will pick up anything else anyone’s saying outside, so . . .
Holly: So my name’s Holly. I’m going to talk to you today about bears, dolls and construction toys. And we’ll discuss the consent afterwards, but first of all – where were you born and when? 01.26 – Holly: Okay. So, teddy bears. Did you have a teddy bear? 01.30 – Holly: No? Not at all? Okay. We’ll move right on. How about dolls? Did you play with any dolls? 01.37 – Holly: [laughs] No. Excellent. Shortest interview ever. How about construction toys? Did you play with any construction toys? Dave: Well, we mainly played out in the street to be honest with you. We played, well, we played football, and kick out ball, and all like that. You would know that, young women like you, but we didn’t really have anything to play with, we just improvised things. We had a string, with a tin can tired on the end of it. Someone stood in the middle of the ring and turned it round, and we all hit it with sticks as it went by. And we called it slapcan, and if you, if you hit the string instead of the can you had to go in the middle and spin it round. Dave: Well, all my friends, little boys, none of them had much in the way of toys, you know. As I say, lead soldiers, they were popular, and you could get them. And you could, well I can’t really think of any other toys I had apart form a few lead soldiers and this fort. I had a rocking horse, a little rocking horse, yeah. 05.24 – Holly: And how did you get the rocking horse? Was it made for you, or did someone else make it? 06.22 – Andrea: So you said obviously you know, you didn’t have dolls or anything like that, did you have any friends, or sisters who had dolls, or played with dolls? 07.35 – Andrea: So did you find yourself actually just playing with what was in the streets? As you say, tin cans, string. 09.05 – Dave: I’ll tell you what I did have, what I did have. I suddenly remembered. It was a [clears throat] excuse me. It were about a foot high, and it were a sailor, you know, with the round hat that sailors have, dressed as a sailor, and you took the bottom off, when you bought it, and it were full of sweets. And you ate the sweets, and put the bottom back on, and then you could do what the devil you wanted with it, you know. But I can’t remember what I used to do with that, but I had it for quite a long time. So that were a doll weren’t it really? 10.40 – Dan: I was interested to know what other sorts of games you played, like piggy, where you made your own toys specific to the game that you were going to play. 13.00 – Dan: I was just wondering if, because you didn’t have any toys, you didn’t have very many toys to play with, but you had siblings that you could play with, so did you find that you spent your time with your siblings and you didn’t really care about not having toys because you had other company? Do you think it would have been different if you’d been an only child and not had any toys? 14.13 – Dave: Just as a matter of interest, where is the museum? 15.00 – Dave: Everyone used to have them sort of thing, aye. They were one of the sort of things you could get during the war you know. And then you used to hang them up on the roof, as if they were flying, you know. Andrea: Yeah, exactly. Okay. Well, I’m going to say thank you everso. Dave: Well I don’t think I’ve been much use to you girls, but . 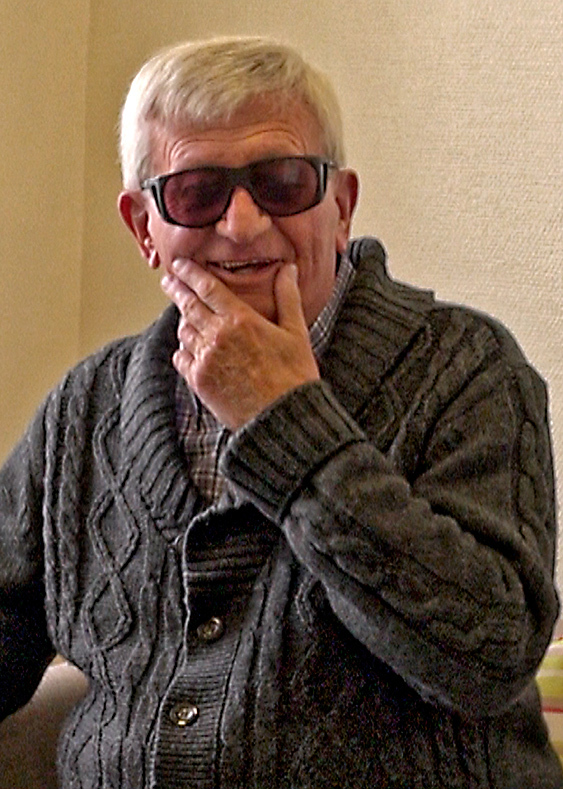 . .
Dave is a member of the art and craft workshop at Blind Veterans UK, Brighton. He was born in Bolton, Lancashire in 1935. He had few toys, and played outside in the streets a lot. In the short version (3m 15s) of his interview he talks about outdoor play, include building go carts. In the full version (16m 32s) he also discusses his rocking horse, a sweet tin in the shape of a sailor, model planes, and passing toys down to other children.